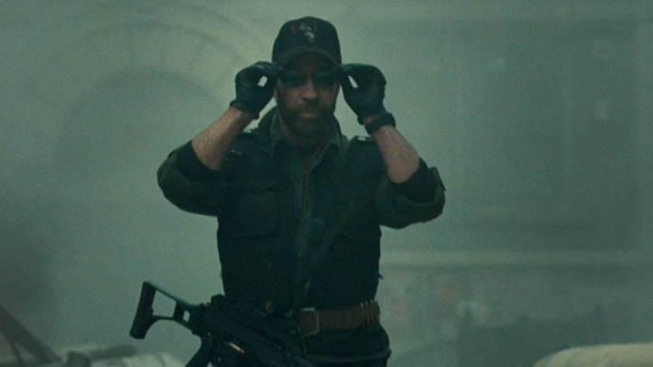 UPDATED: Is Chuck Norris Forcing "Expendables 2" to Be PG-13? Yes and Maybe! That joke casting doesn't seem so funny now, does it, Sly? The Playlist has an excerpt from a Polish interview with action star and "Expendables 2" addition Chuck Norris in which the martial arts icon claims he wouldn't sign onto the film unless star and writer Sylvester Stallone removed all the bad language. "Expendables 2." You know, for kids! Norris goes on to (allegedly - we'll give the interview a grain of salt since Norris's answers were translated into Polish and then re-translated) claim he wants the film to be PG-13 so that his younger fans - who, if they even exist, likely only know Norris as an Internet joke - can come and see him gun down entire cities full of people in a hail of CGI blood without once muttering a potentially harmful and emotionally scarring swear. This proves that Norris not only hasn't seen "The Expendables," but that that he's sticking to his strict criteria of only accepting roles if people ask him and pay him. Regardless, we're still looking forward to "Expendables 3," starring Jeff Speakman, Cynthia Rothrock, Michael Dudikoff, and the guy from "Gymkata." Sylvester Stallone, who has long corresponded with Harry Knowles at the movie rumor site Ain't It Cool News, dropped an email to the AICN webmaster confirming that "Expendables 2" will indeed be suitable for fans 13 and over.